Chocolate is a solid/hard food derived from fermented, roasted and ground seed of the ‘Theobroma Cacao’ or the ‘Cacao Tree.’ Cacao pods contain from 20-40 chocolate beans/seeds and the pods them self can range from yellowish-brown to pinkish-red. Cultures of the ‘Pre-Columbian era’ used these seeds to create a bitter drink. They mixed it with; vanilla, maize (corn), chilli peppers and achiote, to create a spicy, frothy drink. A few decades later, Spanish explorer, Hernando Cortez, took pods from the tree home to Spain as a gift to the royal family where new recipes were made. Eventually, the drink spread across the European continent on account of it’s popularity. The recipe remained almost the same, until inventions were introduced that made the drink into the delicious solid confection we enjoy today. Join in and write your own page! It's easy to do. How? 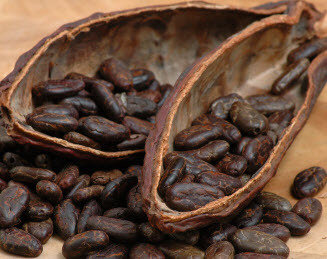 Simply click here to return to Cool facts about Chocolate.